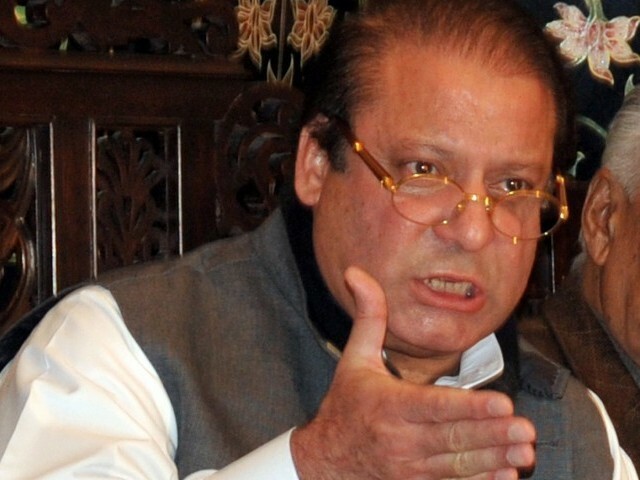 Pakistan Muslim League-Nawaz (PML-N) President Nawaz Sharif on Tuesday said whether the government remained intact or not, any role of the army in politics was unacceptable and the government itself should come forward to save democracy and announce general elections. He strongly criticised the establishment for asking the people to join one or the other party and appealed to the judiciary to play its role in saving democracy. He, however, did not mention the Inter-Services Intelligence (ISI) chief nor replied clearly to repeated questions about demands for the ISI chief’s resignation. He said after every eight or 10 years, dictatorship disrupted the country and the country went into reverse instead of going forward. “Pakistan would have been a developed country if dictatorship had not disturbed the development of the country. South Asia is behind East Asia and in South Asia, Pakistan is a less developed country as compared to others countries,” he said. The PML-N chief then said if early elections were not held, the situation would deteriorate further. He said the PML-N had led the country to development by first signing an agreement with former Indian prime minister Atal Behari Vajpayee in Lahore, then signing a JS Thunder war aircraft pact with China. If that pace had continued, Pakistan would have reached the peak of development, he added. Replying to a question regarding his meeting with Sardar Attaullah Mengal, he said there was still a ray of hope and matters could be resolved. He said the issue of Balochistan could be handled by political leaders and guns were not the solution. “Dictators are unable to resolve issue. People of Balochistan are genuinely crying because they are suffering atrocities. They are passing through a difficult time. But I am seeing a ray of hope,” he said. Replying to a question about whether he would meet President Zardari after his return to the country, the PML-N chief said he would pray for his good health with sincerity. ARMY BUDGET: Nawaz also said he was not seeing any signs that Chief of Army Staff General Ashfaq Parvez Kayani would harm democracy. He said his party demanded bringing the army’s budget in front of parliament and suggesting that a committee be formed to approve the budget of secret agencies and bring it to parliament for final approval. Replying to a question about talks with other parties, Nawaz said all parties of Sindh were part of the government and he would talk to them. He said he would also talk to nationalists because there was no harm in that. He also said there was no choice but to bring the memogate scandal to the Supreme Court because parliament had failed to implement many of its decisions. He said it was essential that the faces behind the memo controversy were unveiled. Talking to media persons in Karachi, the former prime minister said it was the best time to hold election and resign from the parliament. Mr. N. Sharif, it is difficult for me to understand, if you are so sincere with the Nation then why are you still sitting in the parliament. Go ahead bravely to resign. He is not even sitting in the parliament and who knows the direction in which things have started to move he may never sit in a parliament. Can he restart his Ittefaq Foundry without undue government patronage in the shape of SROs and bank loans to prove himself? are they out of NABs control? NO, HE IS MOST DEFINITELY PART OF THE PROBLEM AND NOT THE SOLUTION. HE'S HAD TWO CHANCES AND DONE LITTLE FOR PAKISTAN AND THE PEOPLE. TIME TO GIVE CHANCE TO FRESH BLOODY AND NEW PARTY LIKE MQM or PTI! Why is Sharif crying wolf all the time. This thug only talks against martial law, whereas on Kashmir issue we are yet to hear anything substantial from him. He should stop be fooling the masses. Shame on him and his party. He's just one of the looters and plunderers. Yes because he believes it is his turn now. But nothing would be farther from the reality. This crook will be consigned to the dustbin of history once and for all. Crap politician including Zardari. shame on you both.. only change we believe in Imran khan…. With all the traditional establishment people joining PTI (same as PML-Q), do you still believe in Imran? we need to get rid of these old adherents of power politics….. PLease STO talking always OF Martial LAW,ESTABLISHMENT ETC.FOR God SAke undeRSTAND IT..IT does not help you and undesrtand it is Zardari-Galani-Altaf trap to antogonise you with establishment only to their advantage.Count down failurs if PPPZ,MQM,ML-C,ANP HITTING SKIES AND MERCILLESSLY.YOU,YOUR MEM LIKE KHAWAJA ASIF,SADD RAFIK,SAEED FAROOQ ETC LOOSE ALL GOOD SENSE TO TALK OF ANTI ESTABLISHMENT WHICH TV ANCHORS LIKE HAMID MIR,ARY,EXPRESS,DUNYA,AAJ,SAMAA,CNBC,SOLD TO ZARDARI-ALTAF HUSSEIN DO IT.PLEASE UNDERSTAND IT. If Nawaz wants this government to leave than there is only one constitutional way for that, that is that PMLN must resign from the assemblies. PMLN and it's hypocritical politics is leading to their downfall. Is he talking about Pakistan army! Really brave fantasy.